Representatives from U.S. Senator Sherrod Brown’s office discuss the status of southeast Ohio agriculture and rural development with representatives from Meigs and Gallia Counties. RIO GRANDE — U.S. 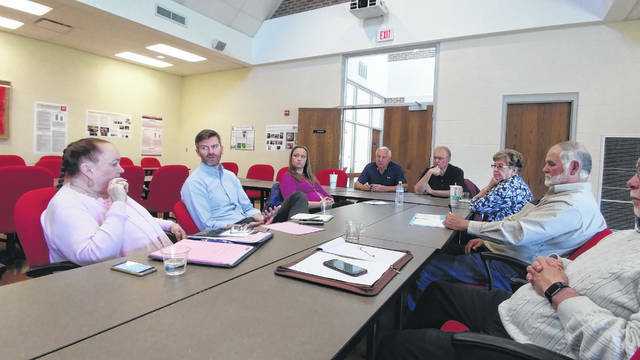 Senator for Ohio Sherrod Brown’s representatives spoke with residents from the Gallia and Meigs Counties Monday at the University of Rio Grande and the Rio Grande Community College to discuss the status of the southeast Ohio agriculture community and rural development. Senior Appalachian Regional Representative Jeanne Wilson along with Legislative Aide Jonathan McCracken represented Brown’s Office. Gallia-Meigs Community Action Executive Director Tom Reed, Gallia Commissioner Harold Montgomery, area farmer and past Gallia commissioner Fred Deel, area farmer Ed Vollborn, the Ohio Farm Bureau’s Ashley Kasler, resident with ties to food banks Carole Roush and Meigs Soil and Water Conservation District’s Steve Jenkins were present for the discussion. Over the roughly hour and a half morning discussion, concerns with internet access to rural communities, the changing nature of southeast Ohio’s agriculture, the future of young farmers, financing agriculture and more were discussed at the roundtable. Brown sits on the Senate’s Committee on Agriculture, Nutrition and Forestry. McCracken referenced recent legislative issues being discussed in Congress geared towards agriculture in the form of a bill but said they maybe they were more appropriately referenced as efforts aimed at farm, food and rural development in general. McCracken said among some of the senator’s focuses include making dairy programs and broadband programs more efficient. Montgomery said he felt at times larger internet companies were less likely to take up getting the “last few miles” of connection to a residence due to a lack of profit generation in rural areas. Brown’s representatives noted they had seen a similar phenomena at times in other rural areas. Montgomery said he wondered if programs created similar to a model used by electrical co-ops might assist in supplying more access for residents. Brown’s representatives said an initiative in Delaware County was exploring a similar option. Wilson said information she had learned in 2007 that towers at the time raised in northwest Ohio could provide internet coverage for roughly 25 miles and the same tower in Appalachian Ohio would provide service to potentially four miles due to the nature of terrain and how it affected connectivity. Deel said he would like to see the a farm bill assist young farmers more and help in expanding operations. He felt youth were having a harder time creating or maintaining farms in the area as the nature of farms in the area had changed. Gallia’s primary agriculture businesses, he claimed, were diary and tobacco focused several years ago. That has since switched to grain, soy, corn and especially beef, according to Vollborn. “I agree with Fred (Deel) on the young farmer thing. I think those people my age are too late to save,” joked Vollborn. McCracken said there seemed to be no magic bullet when considering how to address agriculture concerns but that the senator’s office was looking at a variety of options.